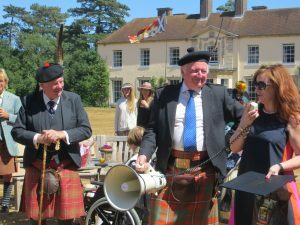 17 September 2018 / Alan Hay / Comments Off on The Chief Celebrates his 40th year as Chief of Clan Hay and Lord High Constable of Scotland. The Earl of Erroll, 28th hereditary Lord High Constable of Scotland and 32nd Chief of Clan Hay, reached the comparatively unusual milestone of a 40-year jubilee earlier this year. 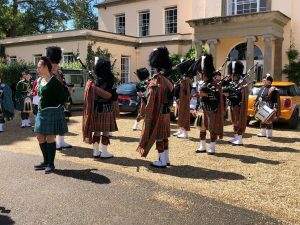 The 40th anniversary of his succession was celebrated with the gathering of 150 friends and family, from all over the world, at his Bedfordshire home on Saturday 28th July. The event came as a complete surprise to the 70 year old Chief. The Countess, along with Pam Rotheroe-Hay, had been planning the celebration for nearly a year and had managed to keep it a closely guarded secret from her husband. Furthermore, he was the victim of an elaborate ruse to get him out of the way whilst caterers, musicians, guests and others arrived to welcome the astonished Chief when he arrived home. Hays had travelled from Belgium, Canada and the United States. 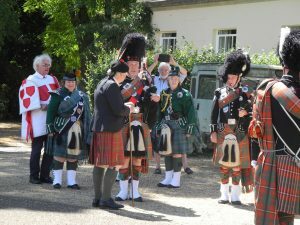 The Chief was welcomed by the Clan Hay Pipe Band – the Hays are unique in being the only clan to have their own band – and representatives of the Doorward Guard of Partizans, the Lord High Constable’s historic personal guard, which is the oldest bodyguard in Britain. 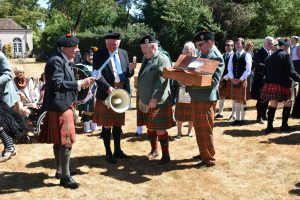 Clan Hay Commissioner, Malcolm Hay of Seaton, presided over the presentation of a wide variety of gifts, thanking Lady Erroll for her hospitality to all. Gifts included a ceremonial sword, made for the occasion and engraved with the symbology of Clan Hay. Clan Hay’s branch in continental Europe gave a clock, also manufactured for the occasion. 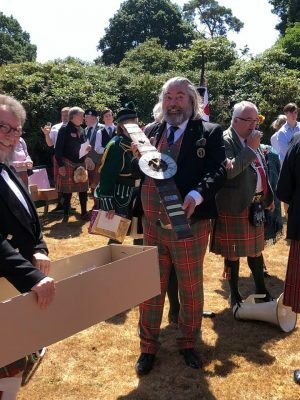 At the other end of the scale, the Earl was presented with a kilt draught excluder! The Earl has been one of the most committed of Clan Chiefs throughout his 40 year tenure. 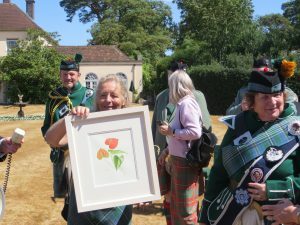 He continues to be actively involved in the management of the Clan Hay Society and to travel widely attending Scottish events across the world. Merlin Sereld Victor Gilbert Hay, 24th Earl of Erroll, born in Edinburgh, 20th April 1948, eldest son of the Countess of Erroll and her first husband, Sir Iain Moncreiffe of that Ilk, 11th baronet. Educated at Belhaven Hill School, Eton College and Trinity College Cambridge. Succeeded his mother as 24th Earl in 1978 and his father as 12th baronet in 1985. Followed a career in IT, has been a director of numerous companies, has sat in the House of Lords as a cross-bench peer since 1978, elected as a hereditary peer following the 1999 Act. As hereditary Lord High Constable of Scotland, he is the senior Great Officer of the Royal Household in Scotland.